Zappone says she is not sure what way to go on the Occupied Territories Bill. THERE COULD BE trouble ahead for the government once ministers return from their summer holidays in September. A division has emerged around the Cabinet table between Fine Gael members and independent ministers in relation to a Bill which calls for a trade ban on goods and services from illegal Israeli settlements. The proposed legislation passed in the Seanad recently after opposition parties including Labour, Sinn Féin, Fianna Fáil as well as independent senators joined forces to support the Occupied Territories Bill 2018. Last week, Junior Ministers Finian McGrath told TheJournal.ie the government had a “major problem” on its hands due to the differing of opinion. He and Junior Minister for Skills John Halligan have both expressed their support for the Bill, however government sources indicate Fine Gael ministers want to do everything in their power to block the Bill. 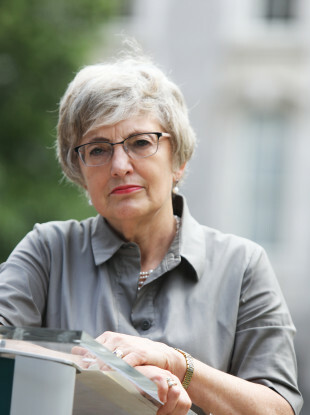 McGrath, who has already entered into discussions with Tánaiste Simon Coveney on the issue, added that the Independent Alliance would be talking about the matter over the summer, and will decide in the autumn if it will be seeking a free vote on the Bill. Now Children’s Minister Katherine Zappone has told this publication that she is yet to decide whether she will support or oppose the Bill. There could easily be differing views as there often is on something that is potentially controversial or trying to figure out these very difficult issues, while also wanting to maintain solidarity with the Palestinian people, while at the same time acknowledging the very difficult and sensitive and delicate arena in the context of the Middle East. I am open to having those conversations, offering my own perspective in relation to it, but I think above all, I think it is important the government comes together in order to make the decision so that it supports the stability, while at the same time we are able to offer our own distinctive view on how we want to work with the different nationalities and jurisdictions. Cabinet ministers are meant to act as a collective when deciding on policy and legislation, however, government has been strained over arguments around free votes in the past. Due to the nature of government, the Independent Alliance has sought a free vote on a number of issues since entering power with Fine Gael. The group has already secured a free vote on the issue of abortion and cannabis. Last year, Transport Minister and member of the Independent Alliance Shane Ross said any issues which are not in the programme for government and are not bound by Cabinet responsibility should be free votes. However, the issue arising from this Bill is whether Fine Gael want it aired internationally that the Irish government was split on whether it should ban trade from illegal Israeli settlements. The Israeli Embassy in Ireland has been highly critical of the Bill, as has former Justice Minister Alan Shatter. Meanwhile Coveney has said prohibiting the import and sales of goods from the territories would not advance the peace process in the Middle East. Email “Trouble ahead? Independent minister undecided on Israeli goods trade ban bill”. Feedback on “Trouble ahead? Independent minister undecided on Israeli goods trade ban bill”.